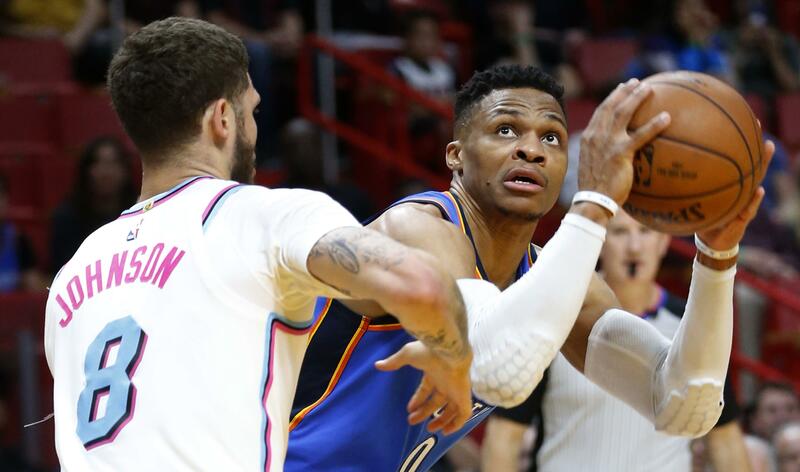 MIAMI – Paul George scored 27 points, Russell Westbrook got his 25th triple-double of the season and the Oklahoma City Thunder clinched a playoff spot with a 115-93 win over the Miami Heat on Monday night. Westbrook finished with 23 points, 18 rebounds and 13 assists for the Thunder, who were down 18 in the opening minutes before outscoring the Heat 39-12 in the fourth. Josh Richardson scored 18 points and Hassan Whiteside added 16 for the Heat, whose playoff seed won’t be decided until the season-finales Wednesday. Justise Winslow and Tyler Johnson each scored 12 for Miami, and James Johnson added 11. NEW YORK – LeBron James had 26 points and 11 assists, Kevin Love scored 28 points, and the Cavaliers got their 50th win and another Central Division title by beating the Knicks. The Cavaliers pulled within a half-game of Philadelphia for the No. 3 spot in the Eastern Conference, bouncing back from their loss to the 76ers on Friday and winning for the sixth time in seven games. They reached 50 wins for the fourth time in four seasons since James returned from Miami and the 11th time in franchise history. SAN ANTONIO – Rudy Gay scored 18 points, Manu Ginobili had 17 and the Spurs rallied late to beat the Kings and clinch their 21st straight postseason appearance. Willie Cauley-Stein led Sacramento with 25 points and 10 rebounds. DETROIT – Jonas Valanciunas scored 25 points, and the Raptors scored the first 13 points of the fourth quarter before holding on for a victory over the Pistons. Detroit was without injured stars Andre Drummond and Blake Griffin for its home finale, but the Pistons still led by 17 in the first half. The margin was only three, however, at halftime, and Detroit managed only 38 points over the final two quarters. Detroit is out of playoff contention, and Toronto had already wrapped up the top seed in the Eastern Conference. The Raptors played without Fred VanVleet and Serge Ibaka. Luke Kennard led Detroit with 20 points and Reggie Jackson scored 16 with nine assists. Langston Galloway had 15 points on 7-of-8 shooting. NEW YORK – Allen Crabbe scored 20 of his career-high 41 points in the first quarter and the Nets beat the Bulls for their first three-game winning streak this season. Crabbe celebrated his 26th birthday by going 8 of 11 from deep Monday. MINNEAPOLIS – Karl-Anthony Towns slammed his way to 24 points and grabbed 18 rebounds for the Timberwolves, who toughed out a victory over the Grizzlies to move one step closer to a long-sought spot in the playoffs. MILWAUKEE – Shabazz Muhammad scored a season-high 22 points and helped spark a key third-quarter run, Eric Bledsoe had a triple-double and the Bucks beat the Magic. The Bucks leapfrogged Miami for sixth in the Eastern Conference. The Heat lost to Oklahoma City on Monday. Milwaukee won its second straight game without Giannis Antetokounmpo, who is resting a sore right ankle. Both victories came against 50-loss teams. Nikola Vucevic led Orlando with 17 points and 10 rebounds, while Bismark Biyombo had 14 points. Bledsoe had 20 points, 12 rebounds and 11 assists for Milwaukee. LOS ANGELES – Anthony Davis scored 28 points, Nikola Mirotic had a double-double and the Pelicans beat the Clippers to clinch their first playoff berth in three years. Mirotic had 24 points and 16 rebounds in the Pelicans’ fourth straight victory. It will be just their second playoff appearance in seven years and they made it without big man DeMarcus Cousins, who sustained a season-ending Achilles injury on Jan. 28. DENVER – Nikola Jokic posted his 10th triple-double of the season and the Nuggets kept their playoff hopes alive by rallying past the Trail Blazers. The Nuggets have won a season-high six straight games and a seventh, on Wednesday night in Minnesota, would clinch their first playoff berth since 2012-13. Jokic scored 15 points and pulled down a season-best 20 rebounds and had 11 assists. Will Barton added 22 points, leading a comeback from an 11-point third-quarter deficit. The Trail Blazers, who lost for the fourth consecutive time, were in it until the very end, but Jusuf Nurkic, who had 20 points and 19 rebounds, missed one of two free throws with 47 seconds left and Jamaal Murray sank two free throws with 30 seconds left to put Denver ahead 84-80. Damian Lillard, who led the Trail Blazers with 25 points, missed a 15-footer and Paul Millsap grabbed the rebound. Published: April 9, 2018, 10:28 p.m.